At Up Energy, we use IES Virtual Environment advanced 3D thermal modelling software for the analysis. This methodology is known as Dynamic Simulation Modelling or DSM for short. 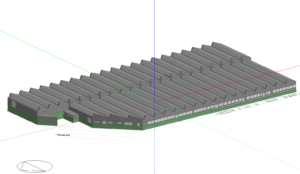 Thermal modelling allows for detailed specification inputs including heating / cooling set points, occupancy profiles, heat gains from equipment, shading devices, natural and mechanical ventilation air exchanges and much more. This provides the design team with important feedback on how the building will function and to assist with design amendments. Thermal modelling of buildings and DSM calculations can be used for Building Regulations requirements, in the form of BRUKL reports and energy performance certificates. We have Level 5 qualified Energy Assessors and are CIBSE Low Carbon Consultants and as such are able to complete the EPC on any project run using DSM. 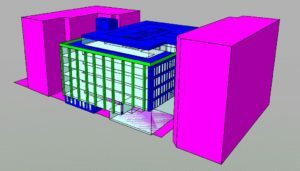 Thermal modelling requires the same minimum input data that SBEM calculations and EPCs would, such as heating and cooling systems, hot water provision, ventilation and lighting information, as well as an accurate model of the building geometry. However, it is then possible to add a huge amount of amendments to the building set up, in the form of occupancy profiles (operational hours and densities), plant profiles with heating / cooling set points, window opening strategies and solar shading control, such as mechanical blinds.